Patrick Wong contributed to this post. Chinese netizens are having a good laugh over the mechanized missteps of government-controlled robot commenters, who have been criticizing messages sent by their own masters. [Jiangsu University students won the International Mathematical Contest in Modeling] In the 2014 USA (International) MCM/ICM contest, Jiangsu University contest team which composed of Jin Xin from the science faculty, Pu Zhiqiang from the automobile faculty, Duan Qian from the electronic faculty had beaten other international competitors from Harvard, The United States Military Academy and won the outstanding award. This is awesome! One of the students happened to be named Pu Zhiqiang. This is also the name of a prominent human rights lawyer who was indicted on charges of “inciting ethnic hatred” and “picking quarrels and provoking a disturbance” on May 15, 2015, after spending over a year in detention. Nearly a dozen robots targeted the message during the Pu's trial, posting new comments that focused on the need to crack down on crime and uphold rule of law. - Break the law with intention, support the police's severe punishment. – Lawyers have knowledges of the law, they break the law with intention, should punished severely! Support police action. – Lawyers should be an occupation that deliver positive energy. Serious crackdown on law breaking lawyers is necessary. – Wish people can learn the law and obey the law. – Lawyer who breaks the law with intention should be severely punished. – Regardless of occupation, those who break the law should “get” punishment from the law. – Support police crackdown on crime according to law. Regardless of occupation, those who break the law should “get” punishment from the law. 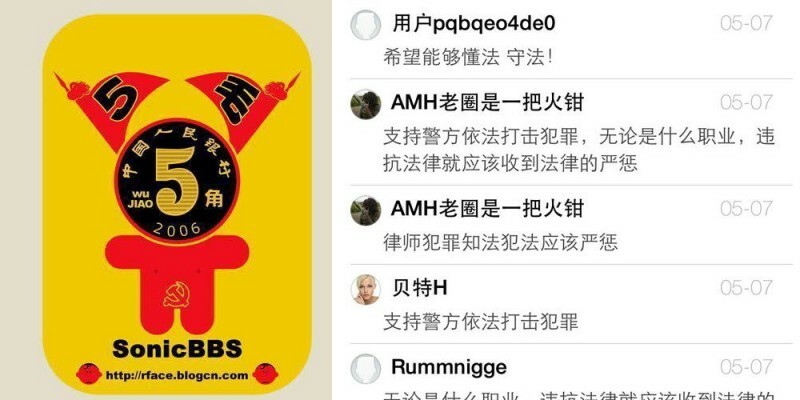 The comments came from the following Weibo user accounts: User pqbqeo4de0 (@用戶 pqbqeo4de0), “AMH old circle is a fire plier” (@AMH老圈是一把火鉗), Beta H (@貝特H), @Rummnigge, Summer of Gardenia Tea (@栀子茶的夏天), User q311p6pm (@用戶q211p6pm), “A flock of birds near skyline” (@天邊一群鳥), “Bring down the white ship” (@打倒大白熊), Rainless sky (@失雨天空) and @jade-stern. The way in which the comments appeared suggested that the program, which controls groups of robotic user accounts, has been equipped with a keyword database containing sensitive words, such as individuals’ names like Pu Zhiqiang or the names of other dissidents in China. The program appears to crawl data on Weibo, which contains the keywords. Once they catch a post, the robot users flood the comment area and randomly post from a set of standardized comments, such as the one above. Although it is an open secret that the social media is flooded with pro-government commenters nicknamed “the 50 Cent Party” (commenters are reportedly paid .50 per comment), netizens’ jaws dropped when they saw the flood of mechanical and awkward messages attached to this outdated and relatively innocuous news post. If you don't believe the existence of 50 Cents, please come here and take a look at the comments. My mum, I laughed too hard, need to take a rest. It seems likely that the comments were prepared by a single source, as the last two comments contain identical typographical errors (收 / get). Weibo is the battlefield of public opinion, has to occupy it. But how can they claimed the stability maintenance money while leaving their jobs to robot 50 cents!! I used to believe that 50 cents are students from the Communist Youth League, prisoners in jail, people working in news centers. Can't imagine 50 cents can be automated. As more and more netizens mocked the stupidity of the 50 Cents, the incident also helped spread word of Pu Zhiqiang's indictment. On May 15, this news thread together with all of the above comments was deleted from Weibo. But Letscorp.net, a site devoted to bridging news between mainland China and other Chinese-speaking communities, screen captured the news and some of the comments. Now, in addition to government-hired and voluntary student online commentators, we can see the robot 50 Cents on social media. It is no wonder that Chinese netizens are leaving Weibo in droves. but not yet linked it into the main site because I am not sure what the policy is on this. I will link it in, in due course, if I do not get any comments that suggest that I should not.